What Day Of The Week Is July 22? 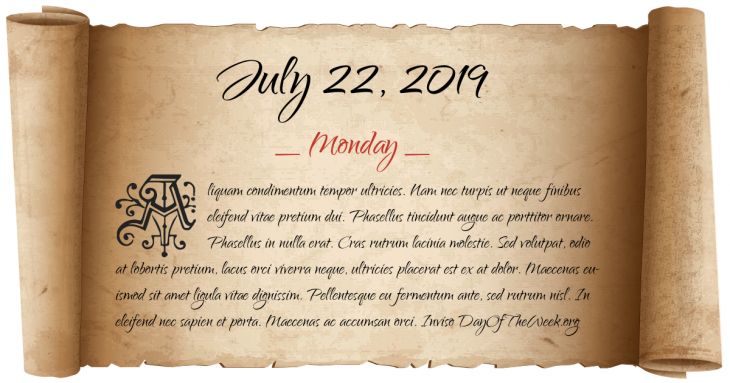 July 22, 2019 is the 203rd day of the year 2019 in the Gregorian calendar. There are 162 days remaining until the end of the year. The day of the week is Monday. Battle of Dornach – The Swiss decisively defeat the Imperial army of Emperor Maximilian I.
Napoleonic Wars: Peninsular War – Battle of Salamanca – British forces led by Arthur Wellesley (later the Duke of Wellington) defeat French troops near Salamanca, Spain. The first ever motorized racing event is held in France between the cities of Paris and Rouen. The race is won by Comte Jules-Albert de Dion. New Deal: the United States Senate votes down President Franklin D. Roosevelt’s proposal to add more justices to the Supreme Court of the United States. Mariner program: Mariner 1 spacecraft flies erratically several minutes after launch and has to be destroyed. Great Flood of 1993: levees near Kaskaskia, Illinois rupture, forcing the entire town to evacuate by barges operated by the Army Corps of Engineers. Israel kills Salah Shahade, the Commander-in-Chief of Hamas’s military arm, the Izz ad-Din al-Qassam Brigades. Who were born on July 22?